The exhibit ‘Des Européens’ brings together the photos taken by the great photographer Henri Cartier-Bresson during his travels across the European continent between 1929 and 1991. The photos are all black and white and portray Europe through its landscapes and inhabitants during different historical stages. They are an open window on the continent through sixty years of history. The photos making up the exhibit highlight the many differences but also the similarities between the countries he travelled through, which emerge powerfully from the streets and landscapes of the countryside portrayed by Cartier-Bresson. 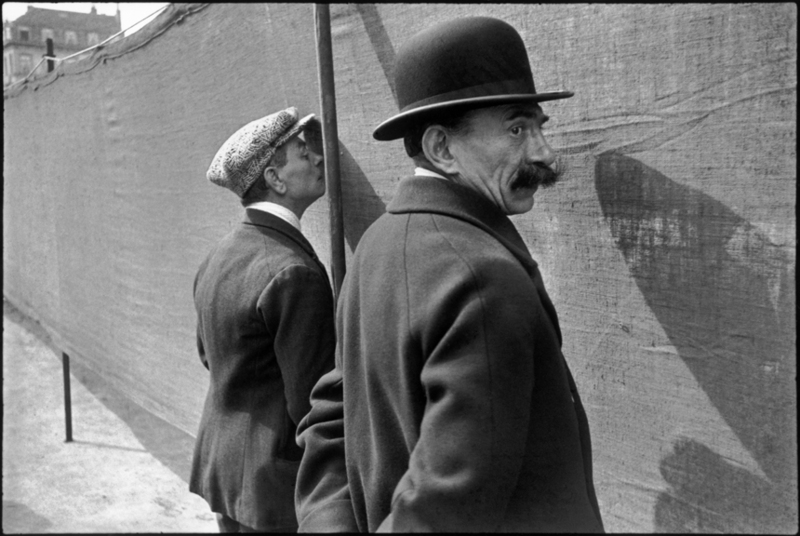 Through these images Cartier-Bresson expresses the joys and tribulations of man; a powerful portrait of Europe in the post-war years, where the rubble and the marks of hunger and suffering carved on people’s faces are still highly visible. In the words used by Jean Clair to describe him in 1998: “A passionate pilgrim, following the beat of an adventurous, pulsating heart, he always returns to his Europe, made of ancient walls. From Austria to Portugal, from Sweden to Turkey, from Lapland to Ireland, for half a century his eye captured the images of a territory that over the years, from the Jean Monnet Plan to the Treaty of Maastricht, has become our own”. 1908 Conceived in January in Palermo, Sicily. Born 22 August at Chanteloup, Seine-et-Marne. Educated at the Lycée Condorcet, Paris. No formal higher education. 1923 Develops a passionate interest in painting and aspects of Surrealism. 1927–28 Studies painting under André Lhote. 1931 Spends one year in the Ivory Coast, where he takes his first photographs. Back in Europe, concentrates on photography. 1932 Published by Charles Peignot in Arts et Métiers Graphiques. 1933 Exhibits at the Julien Levy Gallery, New York. His photographs are subsequently shown at the Ateneo Club in Madrid. Travels in Europe with André Pieyre de Mandiargues and Leonor Fini. Spends a year in Mexico with an ethnographic expedition. Exhibits with Manuel Alvarez Bravo at the Palacio de Bellas Artes de Mexico in 1935. 1935 Spends some time in the USA, where he takes his first photographs of New York and first experiments with film, with Paul Strand. 1936 Works as second assistant to Jean Renoir on “Une partie de campagne” (A Day in the Country). 1937 Directs a documentary on the hospitals of Republican Spain, “Victoire de la vie” (Return to Life), also a documentary for the Secours Populaire, “L’Espagne vivra”. Louis Aragon provides him with an introduction to Regards, where he publishes a number of photographic reportages, including coverage of the coronation of George VI. 1939 Joins Jacques Becker and André Zvoboda as an assistant on Jean Renoir’s “La Règle du jeu” (The Rules of the Game). 1940 Taken prisoner by the Germans, escapes at his third attempt in February 1943. 1943 Works for MNPGD, a secret organization set up to help prisoners and escapees. For Editions Braun, takes a series of photographic portraits of writers and artists (Matisse, Picasso, Braque, Bonnard, Claudel, Rouault etc). 1944–45 Working as part of a team, photographs the Liberation of Paris. Directs “Le Retour” (The Return), a documentary on the repatriation of prisoners of war and detainees. 1946 Spends over a year in the USA working on the so-called ‘posthumous’ exhibition of his work, proposed by the Museum of Modern Art in New York at a time when he was believed to have died in the war. Travels in the USA with John Malcolm Brinnin. 1947 With Robert Capa, David Seymour (Chim), William Vandivert and George Rodger founds the cooperative agency Magnum Photos. 1948–50 In the Far East for three years, in India for the death of Gandhi, China for the last six months of the Kuomintang and the first six months of the People’s Republic and in Indonesia for independence. 1952 His first book, “Images à la sauvette”, cover by Matisse, is published by Tériade. 1954 Publication by Robert Delpire of his book on Balinese theatre, “Les Danses à Bali”, with a text by Antonin Artaud, marking the beginning of a long collaboration with Delpire. He is the first photographer to be allowed into the USSR during the period of détente. 1955 First exhibition in France at the Pavillon de Marsan in the Louvre, which subsequently travels all over the world. Tériade publishes « Les Européens », cover by Miró. 1958–59 Returns to China for three months for the tenth anniversary of the People’s Republic of China. 1963 Returns to Mexico for the first time in thirty years, staying for four months. Life Magazine sends him to Cuba. 1965 Spends several months travelling in Japan. 1966 Returns to India. Terminates his active working relationship with Magnum Photos, although the agency distribution retains his archives. As before, his photographs are printed by Pictorial Service. 1967 Commissioned by IBM to create ‘Man and Machine’. Returns to India. 1969-70 Spends a year travelling around France for Reader’s Digest and publishes a book, “Vive la France”, to accompany the exhibition “En France” staged at the Grand Palais in 1970. In the USA directs two documentaries for CBS News. 1972 Returns to the USSR. 1975 First exhibition of drawings at the Carlton Gallery, New York. Concentrates on drawing but continues to practise portrait and landscape photography. 1981 Grand Prix National de la Photographie presented by the Minister of Culture in Paris. 1986 In Palermo, presented with the Novecento prize by Jorge Luis Borges’ widow. 1987 The Museum of Modern Art, New York, stages the exhibition of photographs “Henri Cartier-Bresson : The Early Work”. 1988 The Centre National de la Photographie celebrates his 80th anniversary. 2000 With his wife Martine Franck and daughter Mélanie, makes plans to set up the Henri Cartier-Bresson Foundation, to provide a permanent home for his collected works as well as an exhibition space open to other artists. 2002 The Henri Cartier-Bresson Foundation wins state-approved status. 2003 Inauguration of the Henri Cartier-Bresson Foundation. Retrospective exhibition « HCB de qui s’agit-il? » at the Bibliothèque nationale de France.